There’s a new voice this side of the horizon and it goes by the name Brian Combs. Approaching sanctity on “Hurricane,” Combs spits hardscrabble truths across the tracks of Lexington, Kentucky with his tumbled gravel delivery, imparting Einsteinian wisdom on “Featherless Appendages” and dissolution on “Mainline” with its desert echo. Conjuring a musical storm from darkened skies, Combs passes lessons learned onto future generations, empowering those offspring to rise against past mistakes. 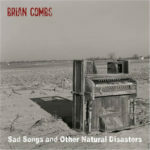 Released via Shaker Steps, you can stream/purchase the Vinyl Worthy Sad Songs and Other Natural Disasters below.